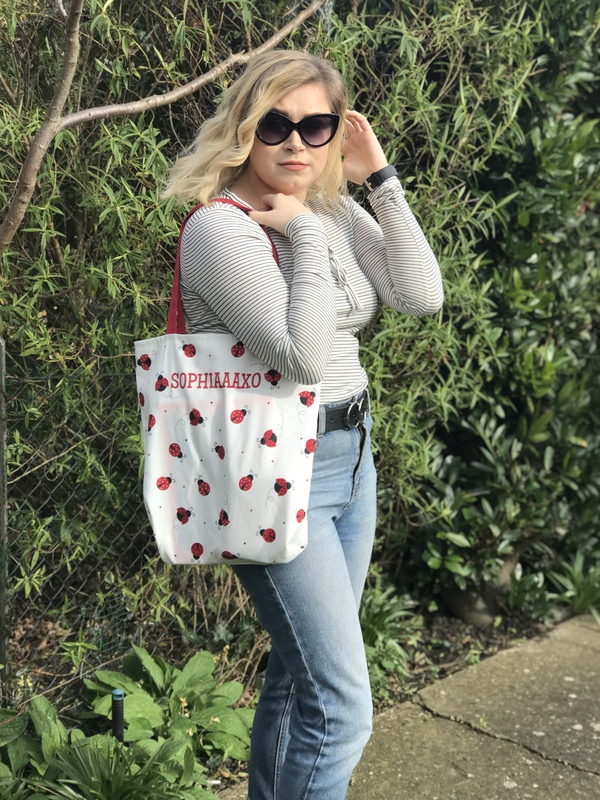 I HAVE MY OWN PERSONALISED BAG! I HAVE TOO MANY PICTURES, BUT I DON’T EVEN CARE. I am sure that you can tell that I am very excited! the other week Personalised Parties kindly sent me* one of their tote bags. So thank you so much for that! and in today’s post I am going to be reviewing it. ALSO THERE ARE ALOT OF PICTURES IN THIS POST, BUT I LOVE THEM ALL SO MUCH AND COULDN’T PICK WHICH ONES TO GET RID OF OR KEEP! I absolutely love the design of this bag. I think it is so cute and very summery and will perfect for those sunny days. It is such a sturdy bag and it is really good quality. I think the strap is a good size as it is long enough to put over your shoulders but also you can just hold it or hook it over your arm. The size of the bag is good, it fits a lot of stuff inside which makes me happy. It also has a little pocket inside to pop your phone in or your hairbands, or something small just so you don’t lose them at the bottom of the bag. The print is on both sides, so on the back and front of the bag which is consistent < I like it. 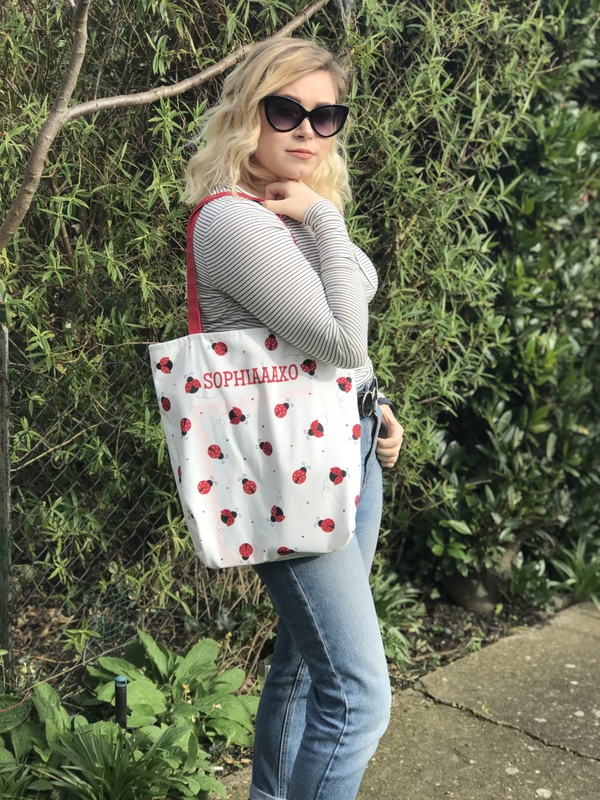 They have some really good designs on the other bags on their website, which is good because they have a good variety. 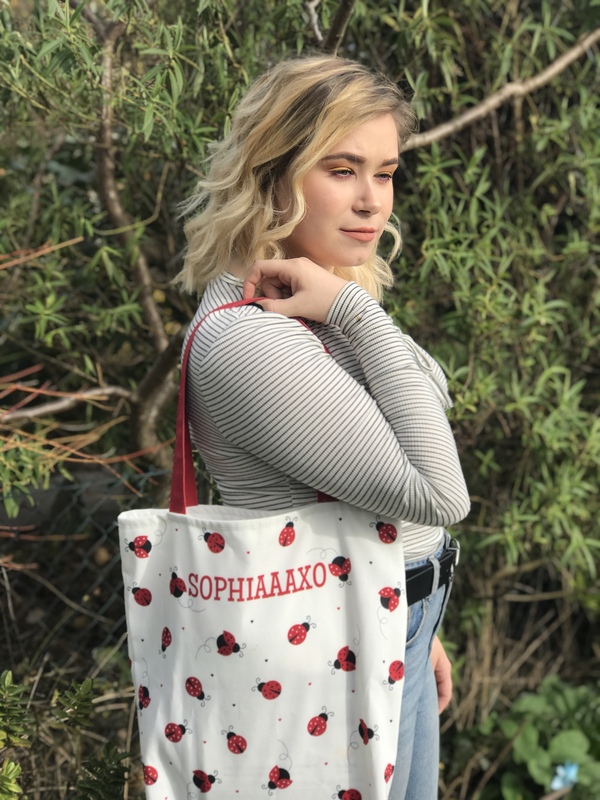 I love the lady bird one because it is very cute and I love that the majority of the bag is white, and I thought that It would probably go with most things. 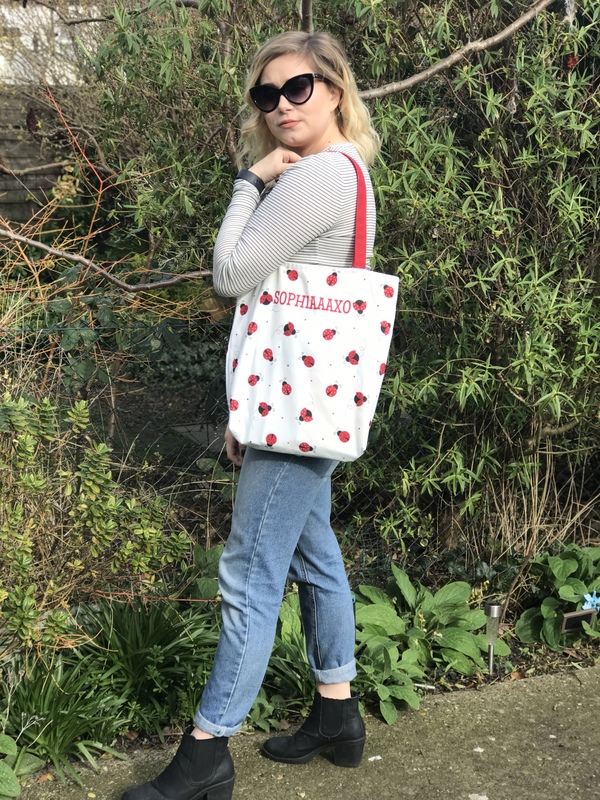 I love their tote bags for different occasions, they currently have a spring tote bag and it is the cutest bag ever. 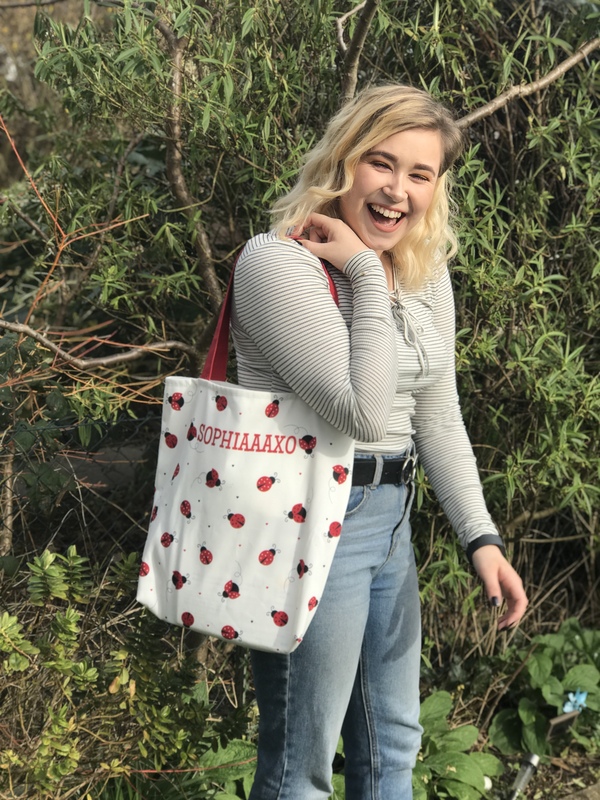 YOU NEED TO CHECK OUT THEIR BAGS! Click here to check it out! 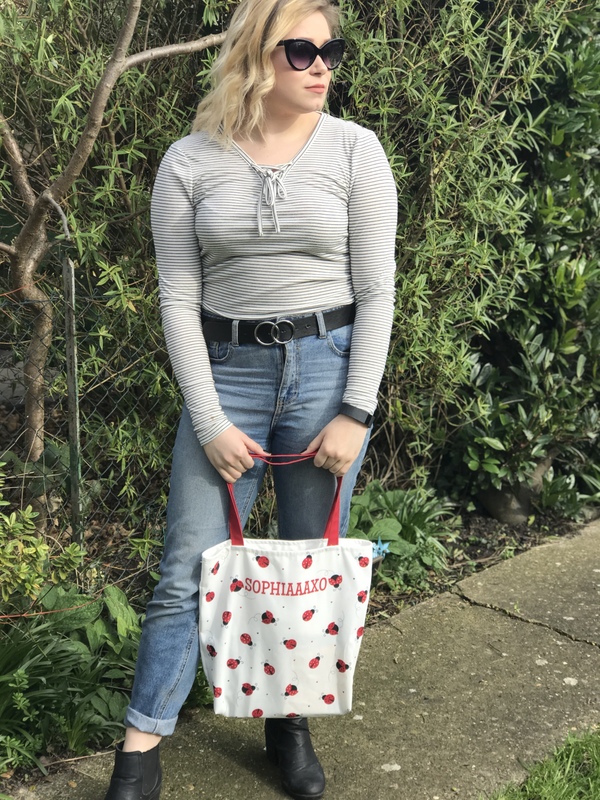 The tote bags retail for £22.99 which I do think it a bit pricey, but if you think that you are getting a really well made bag of your choice, that is personalised and sent straight to you then it isn’t bad. 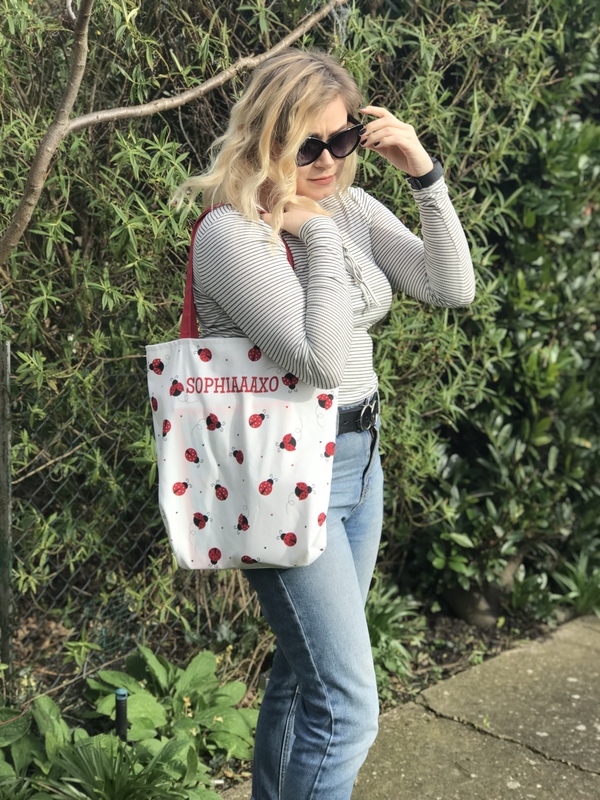 If you are the sort of person that would rather spend a bit more money,for better quality, then this bag is great for that. Navigating around the website wasn’t hard at all, I found it quite enjoyable because they really allow you to personalise the bag yourself. 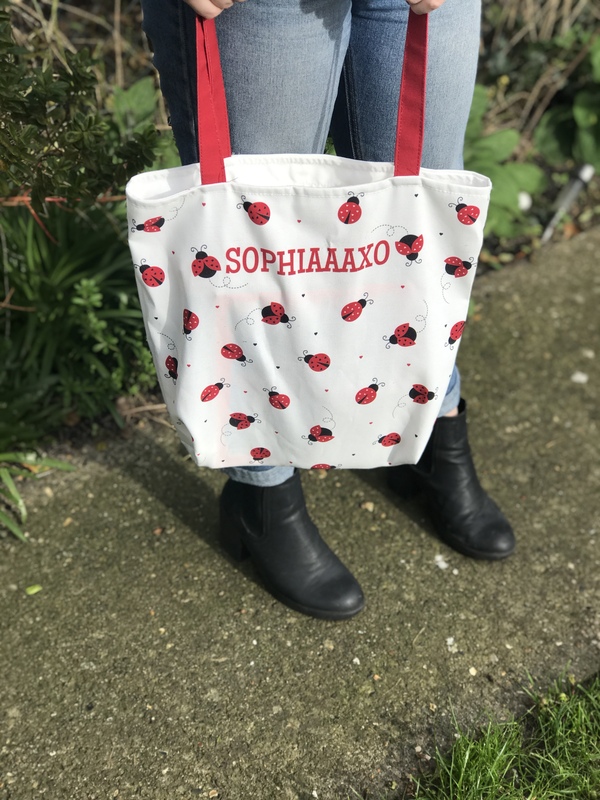 Not only do you get to pick the style, put you can decide on anything you want on the bag, the font it is printed in and the colour of the font. You get to choose if you want the bit that is personalised on the front of back of the bag and I had mine of the front of the bag. The website was super easy and very quick to order. They are a personalised parties company that also supply party goodies such as themed party packs and books and gifts. The worst thing is when you have a really difficult website and you just can’t be bothered with the hassle, so just click off and continue with your day.. this website was great! – I am going to be taking it to the beach with me, where I can take all of my little bits such as a purse, my camera, my sunnies and all that good stuff in it. Then I am going to take another bag with my towel and bikini etc..
– I am using it at the moment to keep my magazines in it. I have it hung up over my wardrobe handles because it is cute and I want the bag to be on show. IT ALSO HAS MY BLOG NAME ON IT! I FEEL SO SPECIAL! – I am going to be using this as a general bag in the summer. I know that it isn’t too heavy and it is easy to wear. It isn’t a pain to carry around with me because I can put it over my shoulder and it’s all good. 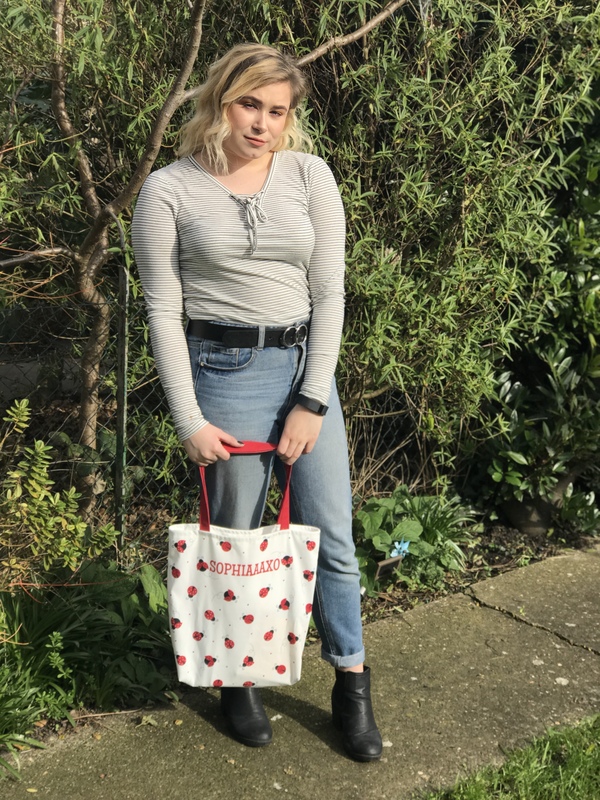 I love this bag, I think it is such a handy bag to have and I know that I will be using it a lot in the summer. What are your thoughts on the bag? 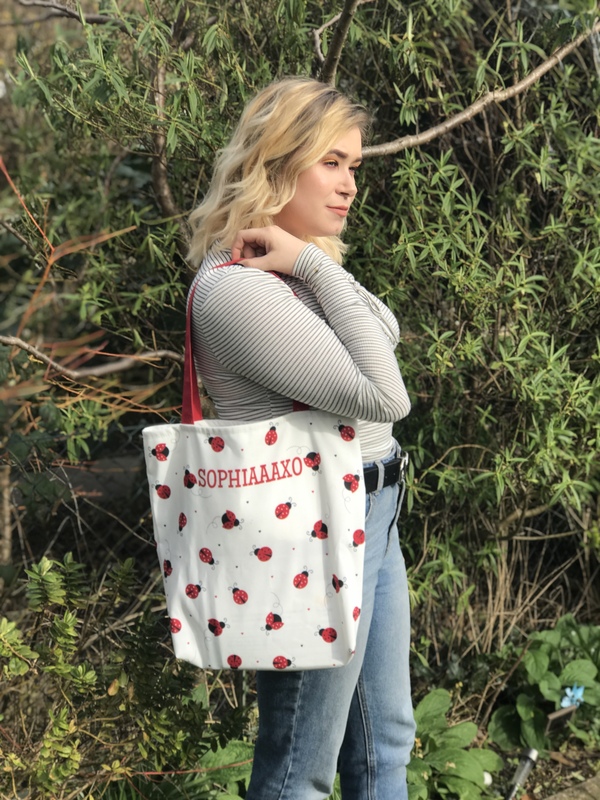 If you have looked at their website, what bag do you like the look of? That bag is so cute. I love the lady bugs. HEY–RIGHT IN TIME FOR SUMMER!